I love a Banana Bread when there is a perfect balance of banana throughout the bread and it is not overpowering. 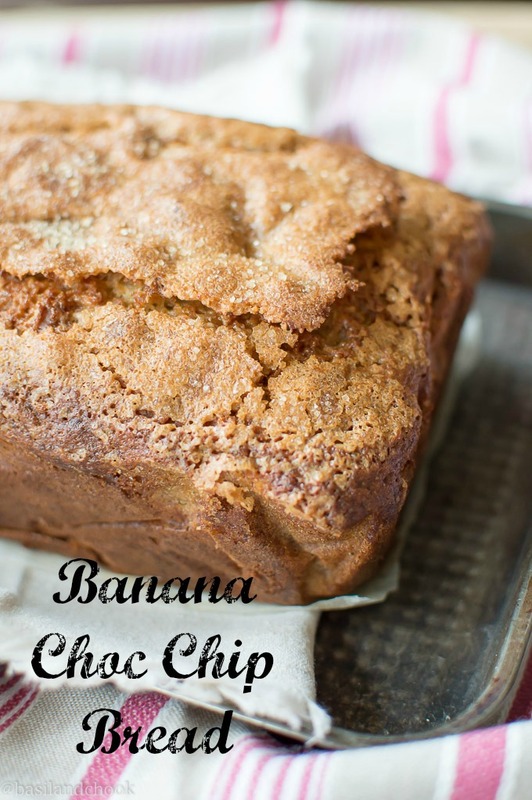 There are just two medium bananas in this delicious loaf and it’s just right. 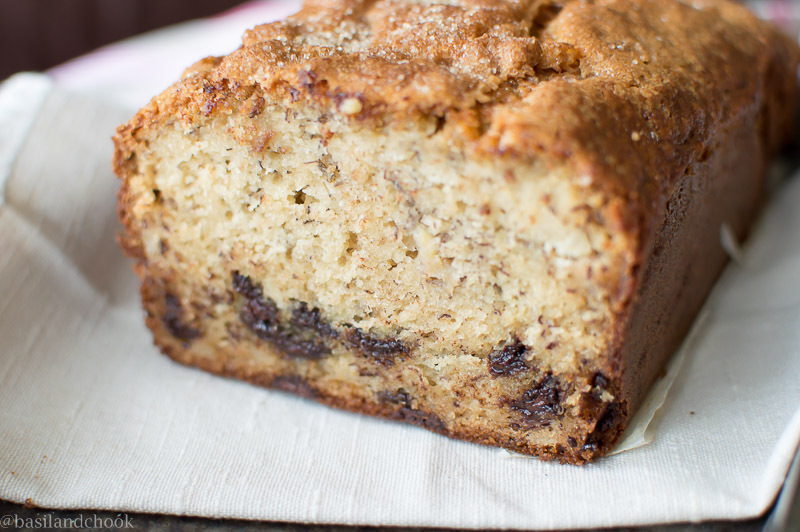 A delicious moist Banana Choc Chip Bread that you could eat almost any time of the day. Line loaf tin with baking paper. Add 2 bananas, brown sugar and caster sugar into a large bowl. Mix together until the bananas are mashed and the sugar is blended in. Add 2 eggs and vegetable oil, mix until blended. Add flour, baking powder, baking soda, and salt, mix gently. Add choc chips then gently fold into mixture. Sprinkle the raw sugar over the top. Bake for 55 minutes. Depending on your ovens cooking time, insert a cake tester into the centre, and it should come out clean. Cool bread in pan for about 10 minutes. Turn bread out onto cake rack and cool completely. To prevent the choc chips from sinking to the bottom, place the choc chips in a bowl with 1 teaspoon of plain flour and shake them around until they are covered. When I make this bread, sometimes those choc chips like to have some fun and make their way down to the bottom of the bread. To prevent this I place the choc chips in a bowl with 1 teaspoon of plain flour and shake them around until they are covered. This does work for me sometimes but sometimes the choc chips have a mind of their own and decide they just want to hang out at the bottom. It doesn’t matter though as it still tastes amazing! 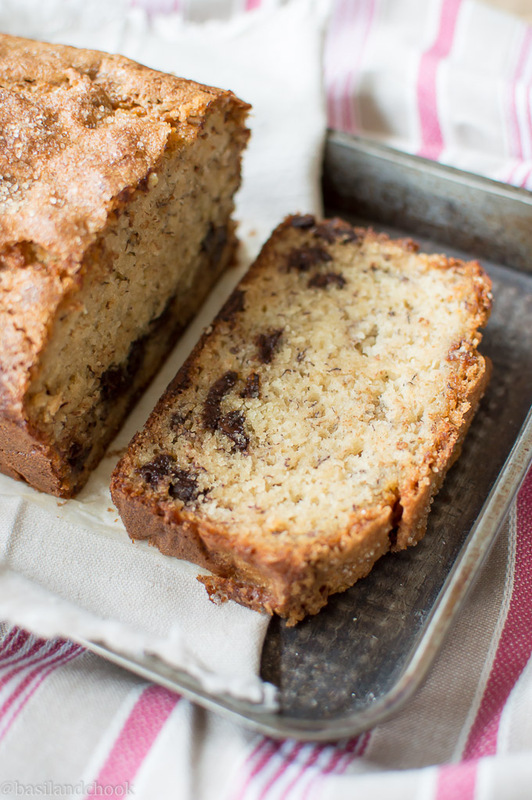 This is a delicious moist Banana Choc Chip Bread with a crispy sugary top that you could eat almost any time of the day.